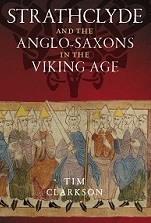 Strathclyde and the Anglo-Saxons in the Viking Age was published last week. As the author, I receive six free copies, which made their way down the M74 on Friday. I took this photo a couple of minutes after they arrived. The book’s contents and a list of chapters can be found at my Senchus blog. This entry was posted in Research on October 28, 2014 by Tim. Do you think they will have copies at Govan Kirk soon? I thought they might as well have the commission as Amazon. Yes, I’m hoping it will be available at Govan Old for the 2015 visitor season. Too late for this year, unfortunately (the current season ends on 31 October). G/daughter Helena (12) up this week from Stockport. We went to Dumbarton Castle this afternoon – pretending to be S/clyde Brits! It brightened up just before we got there – wonderful views! Eeek! Vikings rowing up the Clyde!! At Dumfries last weekend – went to Ruthwell. What were these nutty reformers thinking about, smashing it up? Have you seen Bewcastle? Do you think these two had something to do with N/umbrians in Rheged. We were also near Mote of Mark. Sounds like you had a good day at Dumbarton, Jim. On a clear day, the view from the summit is certainly impressive. The Bewcastle Cross has a connection with Rheged because one of its inscriptions seems to commemorate Alchfrith, king of Deira, whose mother was a Rheged princess. Whether the cross was set up in the former lands of Rheged is however a moot point, as nobody knows where Rheged was situated. Same applies to Ruthwell, which was carved around the same time. I don’t know if I can wait! I will maybe just buy it and put a fiver in the box at Govan. PS Rheged is a mystery, isn;t it. I’m sure I have read that some professionals don’t believe in it. Over at my Senchus blog you’ll find much debate about Rheged, peppered with my own sceptical views (as set out in The Men of the North). The conventional idea of a massive kingdom straddling the Solway Firth and large parts of northern England is a Game Of Thrones-style fantasy. There is no evidence that Rheged was even a kingdom, still less that it was centred on the Solway lands. Oh, how exciting! They look great. Congratulations! Thanks Jo. 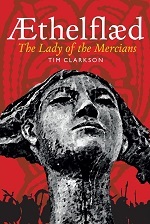 I’m very pleased with the cover, which was designed by James Hutcheson at Birlinn after I selected a suitable manuscript image (a depiction of Pharoah as an Anglo-Saxon king).